Sometimes I chase sunsets and they don't turn out to be what I was hoping for because any clouds present during the day have disappeared. I wasn't chasing this sunset. I almost missed it. I was actually taking the trash to the recycling container and that sunset seemed to suddenly appear. 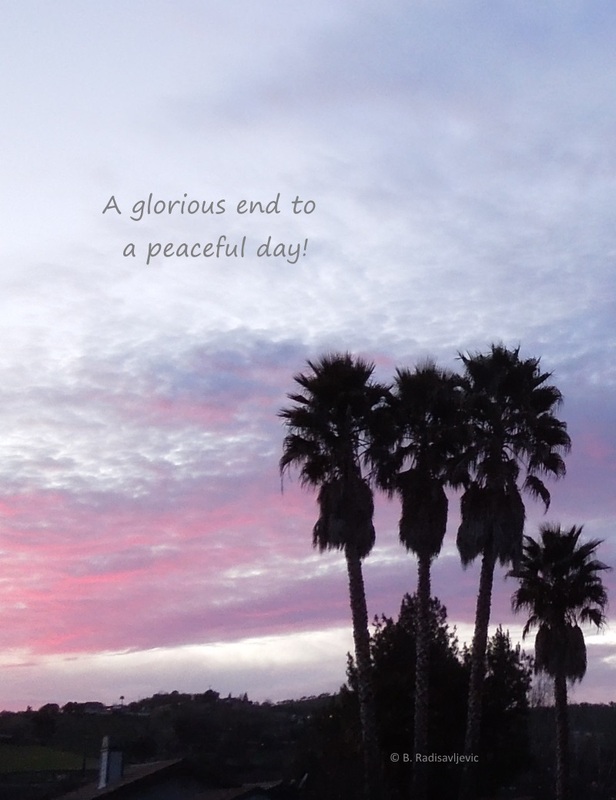 It's been a peaceful day, and this sunset was a fitting way to bring it to a close. Heav'n and earth are full of Thee! O Lord , Most High! It's beginning to look like spring in Paso Robles. 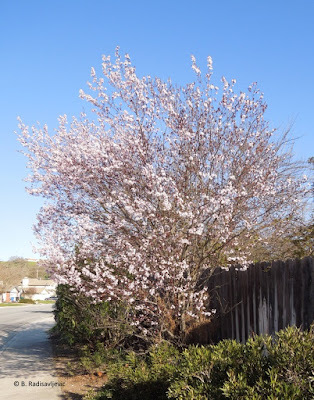 Not only are there trees flowering on the streets and in neighbors' yards, but the plants that have been awaiting nature's call are beginning to wake up and bloom. The garden is full of surprises. To the right you see my irises waking up. 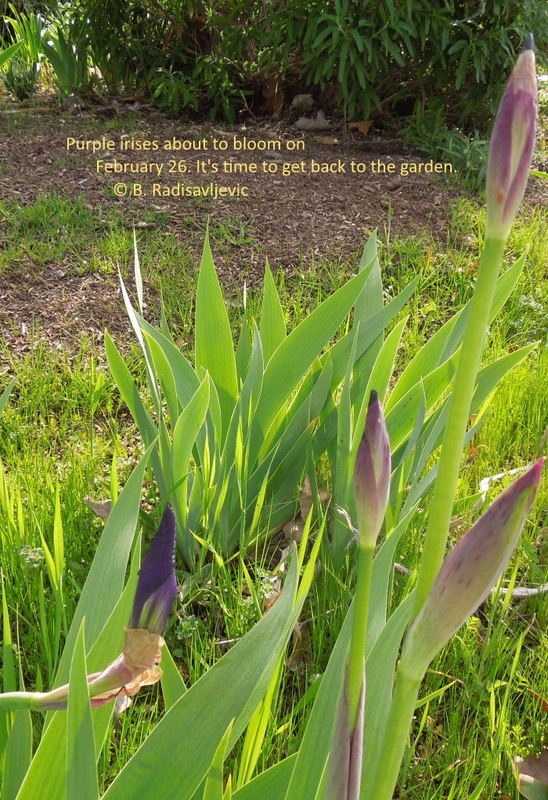 Two days ago I could see the buds that had not yet shown their purple color. Five days ago there was actually one flower near these buds, but it faded before I could get out with my camera. One flower appeared in this particular clump of irises last year in December, but my purple irises usually don't flower until April. 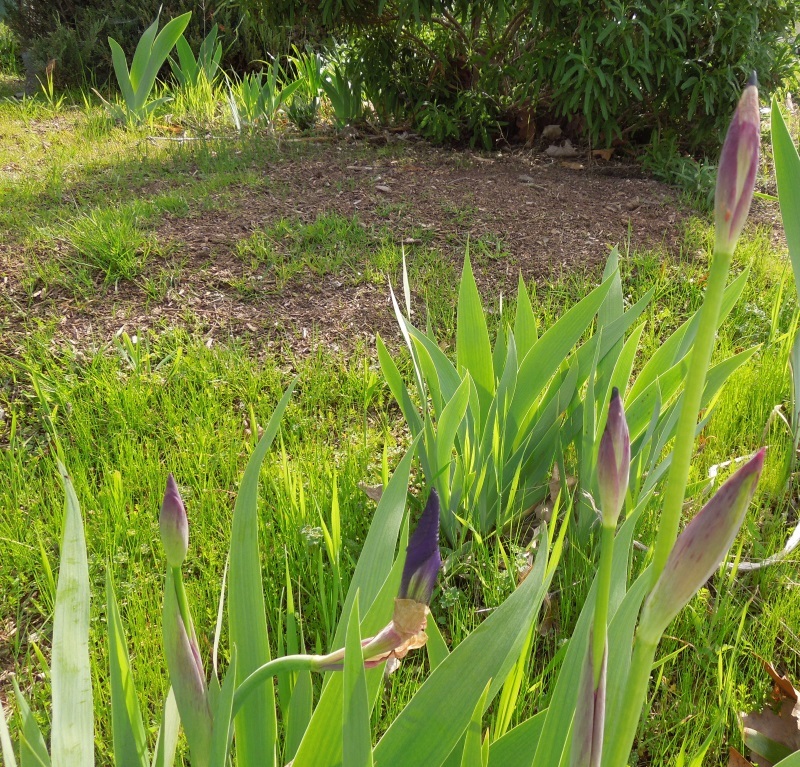 Here's another view of this iris patch taken today. It's not just irises. Rosemary is beginning to show more blue flowers and on the top the blue is winning over the green. This will make the bees very happy. The black sage plant you see behind the irises is also just beginning to produce some open flowers. 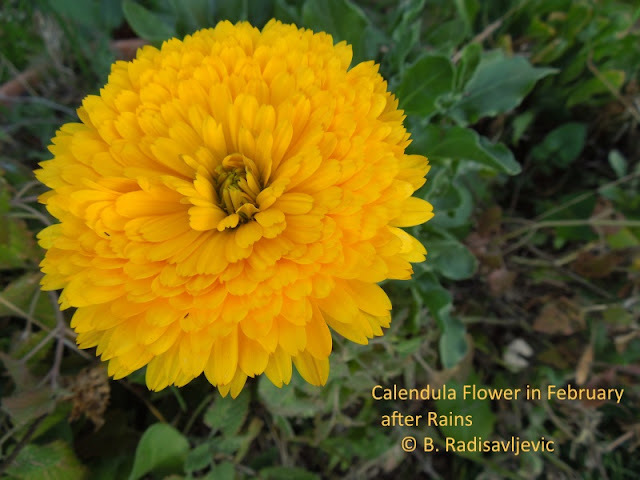 The calendula never seems to sleep, but since the rain it is producing some of the largest blooms I've seen all year. Here's one of them. The biggest surprise of all I discovered in my garden was what you see below. 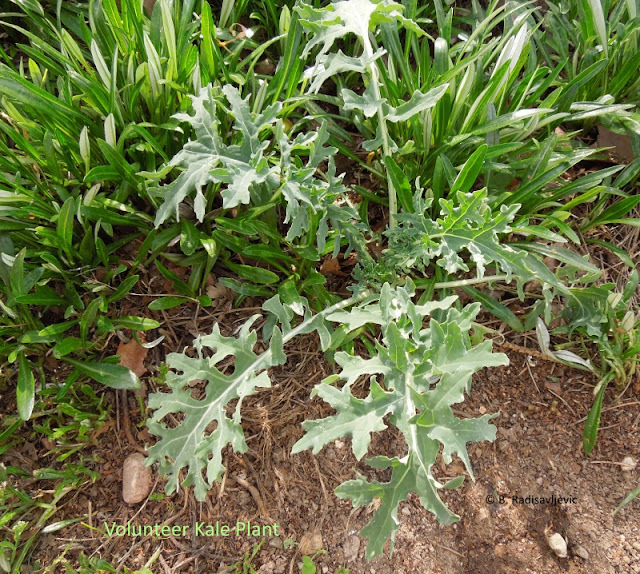 Just after I planted some kale seeds I had collected last week before the rain, I discovered this plant growing a long distance from the mother plant I'd collected seeds from before I pulled the plant out. This is where the mother plant was in June last year. You can see it flowering and making seeds. I like collecting and saving my own seeds. You will notice the kale is growing in front of the house. At the back right you can see the garage wall. 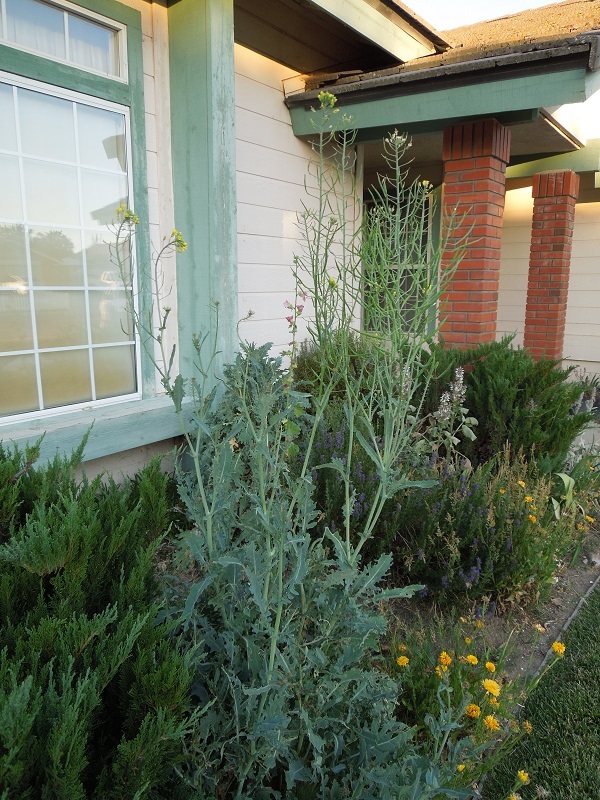 To get to where that photo of the kale volunteer plant was taken, you would need to walk around the garage and across the driveway -- not a very direct route for the wind to blow the seeds. Had I planted the seeds myself in the poor soil at the edge of that clump of gazanias that gets nothing but rain water, I doubt if they would have sprouted. Who would choose a place like that to plant? God did. It appears the plant is thriving with no help from me at all. Nature never fails to amaze me. I cannot walk a block without seeing blossoming trees in my neighbors' yards and on the street. It seems all my neighborhood trees are in bloom. 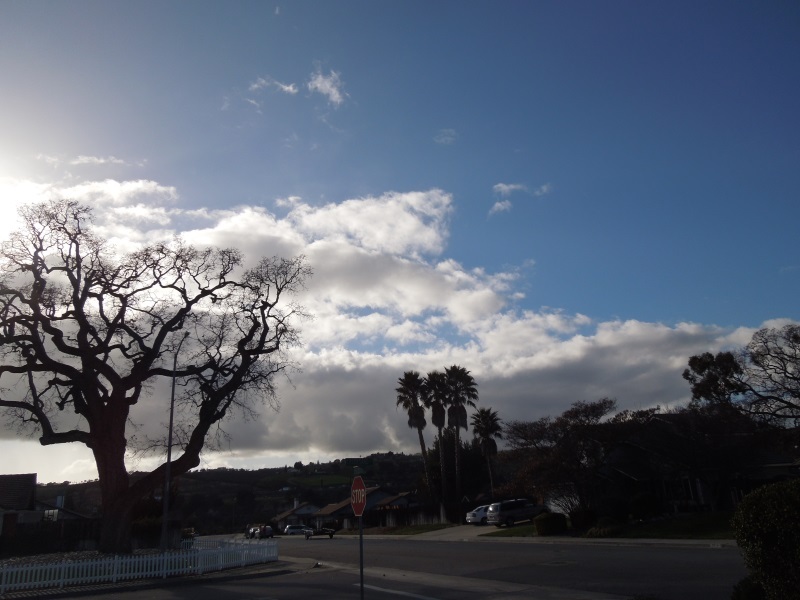 I took this photo looking toward the entrance of our Riverbank tract in Paso Robles. Click to enlarge and see the details. 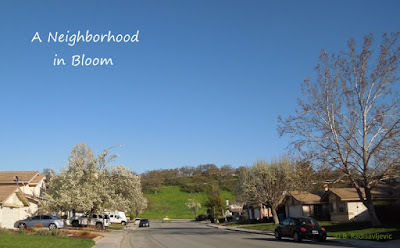 The trees you see blooming with white blossoms in these photos are Bradford Ornamental Pear trees. Paso Robles has been very generous with them. You can also see them blooming downtown along many residential streets, and many of the businesses also use them in their landscaping. They are gorgeous in spring and are among the most colorful trees in autumn, as well. The photo above gives you an idea of how tall they can become. Above you see the blossoms of the mature tree close up. 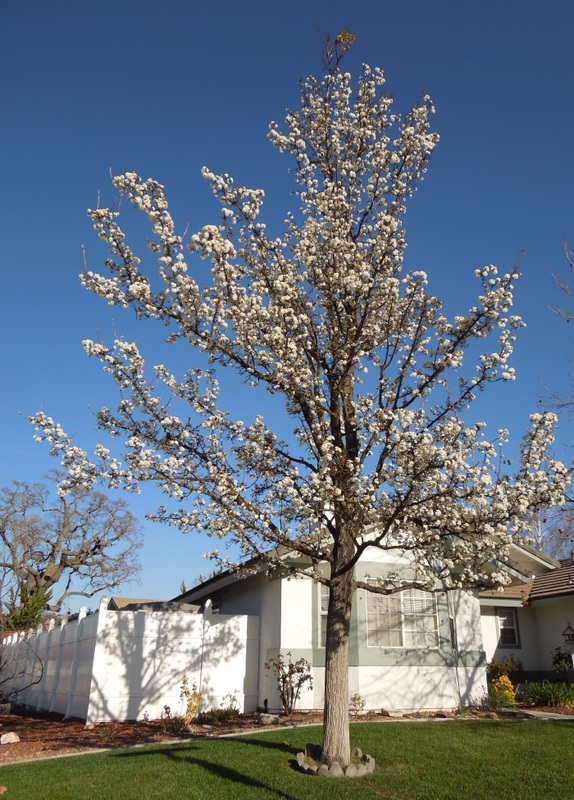 The photo above shows a blooming sucker of another ornamental pear . Of course, ornamental pears aren't the only trees blooming now. 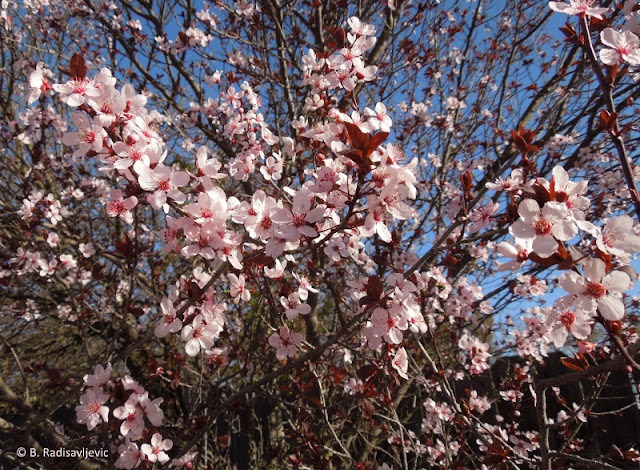 Fruit and nut trees are also blooming in backyards. 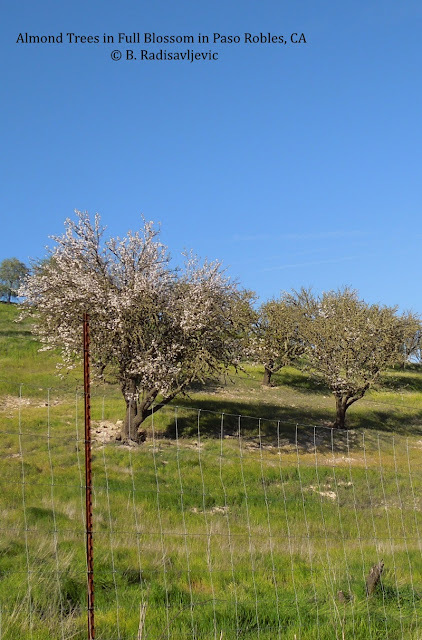 You've already seen the almond trees blooming. The peach tree in my Templeton yard is also in bloom. Most of the trees I see on the street here, though, are ornamental. 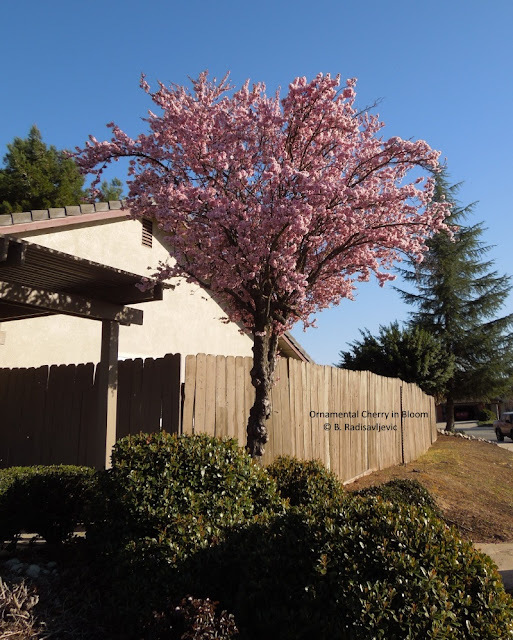 This ornamental cherry in a neighbor's yard is one of the most beautiful. My neighbor says it does not produce fruit. We also have trees with blossoms in lighter shades of pink. The most popular is the ornamental plum. 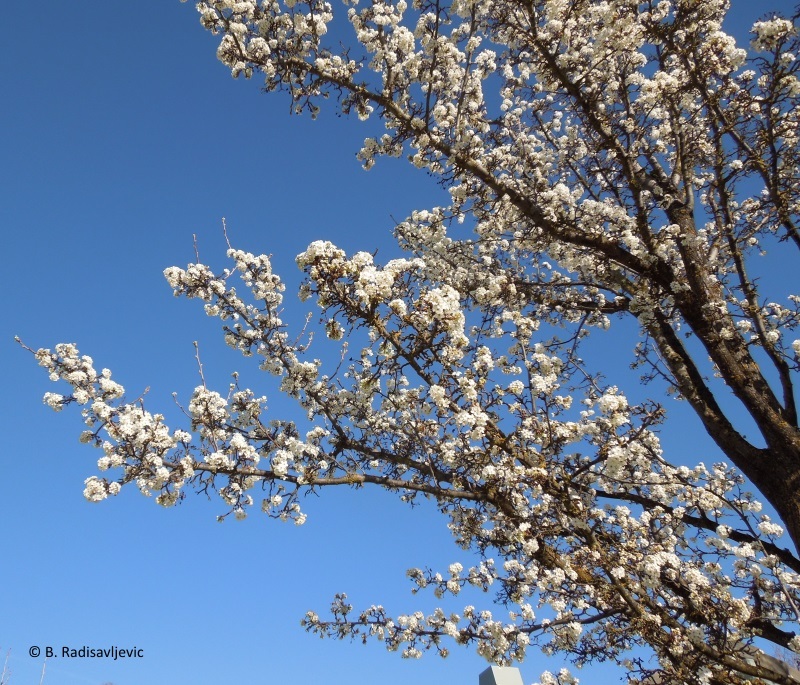 You can often hear a blooming ornamental plum or pear tree as you approach it, because the bees love flowering trees. The ornamental plum tree produces small fruits, and some people make jelly from them. They are too sour to do much else with. When the blossoms are gone, the tree's purple leaves continue to add color. 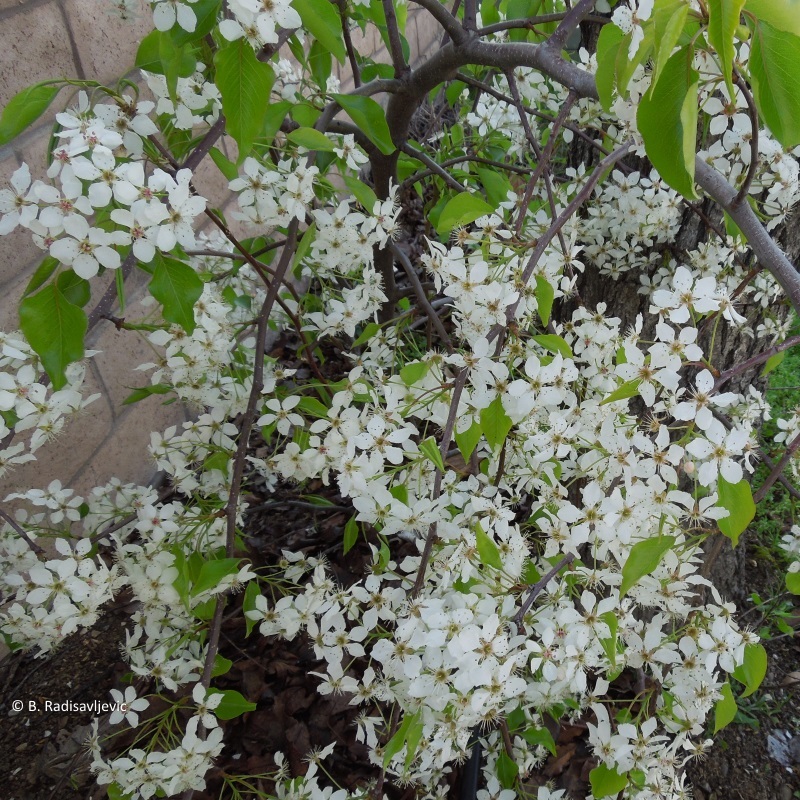 This ornamental plum is in my side yard. You can click the photo to enlarge it. It zeros in on the flowering plum tree's blossoms. 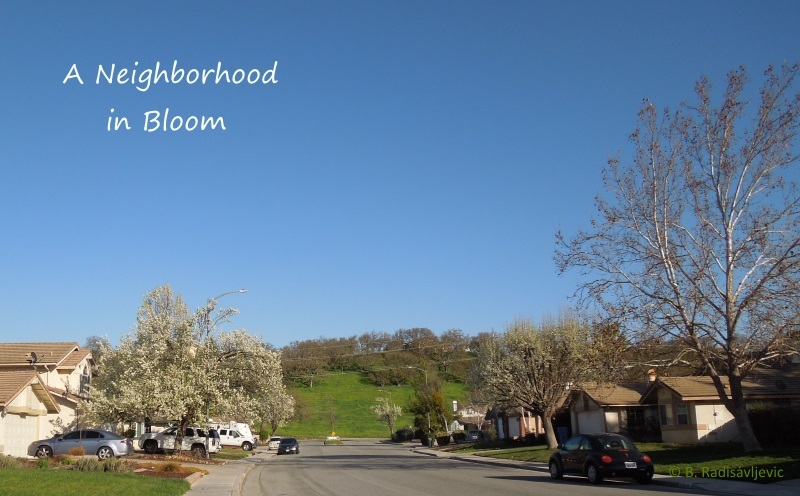 What trees are blooming in your neighborhood? Actually, the almond trees have almost finished blooming, but I finally had the opportunity to stop and photograph some this year. I'm happy I got the picture, but not so happy about what happened afterwards. You can read about that here. What happened afterwards explains one reason this post is so short and why there was no post yesterday. Using my right hand is difficult. Today's students don't have the same view of George Washington that I remember from my second grade teachers. He was then revered as the Father of Our Country. This is the way most in my generation think of him. 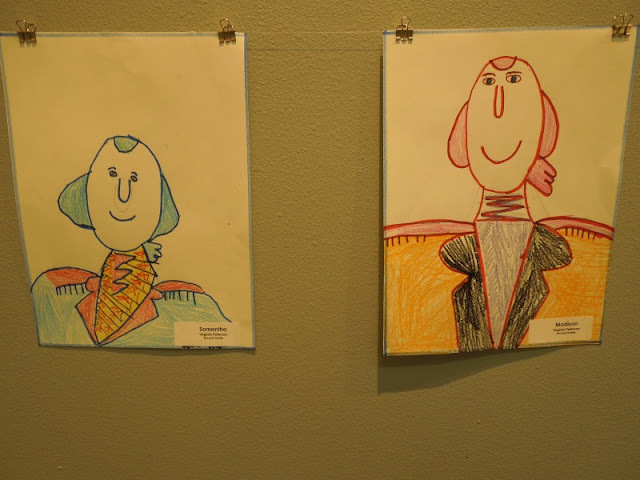 This is the way some second grade students in the Paso Robles School District draw George Washington. I took this photo in the school district's special gallery at Studios on the Park. They probably used a picture similar to the one above as a model. They can only draw what they can see. They are also likely to gain their first impressions of the Father of Our Country from what they are taught. I hope they are not being taught a vision of our first president conjured up with politically correct hindsight that demonizes George for being a man of his time, and ignores the good he did and the wisdom he applied to governing the country as its first president. If you are a parent, this might be a good day to ask your children what they have learned about George Washington and set the record straight if they have been misinformed by the media or a teacher with an agenda. Although the story about chopping down of the cherry tree where young George is reputed to have said when accused of doing the deed, "I cannot tell a lie," has been debunked by today's historians, it does not change the fact the George Washington was a man of good character who is getting a bad rap today. He is the only president who was able to unify a country enough to be elected unanimously the first President, a job he took reluctantly, after presiding over the writing of the Constitution. 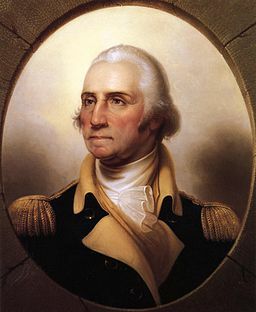 As Commander in Chief he persevered in pursuing victory in the Revolutionary War over a powerful enemy against whom there was little chance he could prevail. His army was demoralized and more soldiers were quitting every day. 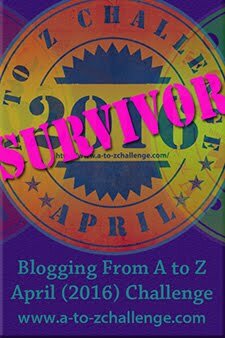 But he pressed on against all odds and won. He had more backbone and character than most, if not all, of today's politicians. Learn more about the real George Washington in the books below, one of which consists of his own writings. Another was written by a man of his own time who knew him well, John Marshall. Who can tell us more about a man than the people who interacted with him when he was alive? Who can reveal the thoughts of a man better than the man himself? 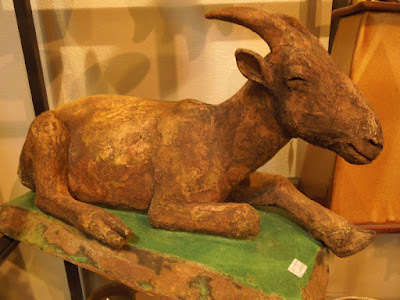 I meet a lot of goats in North San Luis Obispo County. I see most goats on small farms, but occasionally I see one as art, like this one I found at Studios on the Park in the Fine Crafts Studio. Unfortunately, I could not find the artist's name. 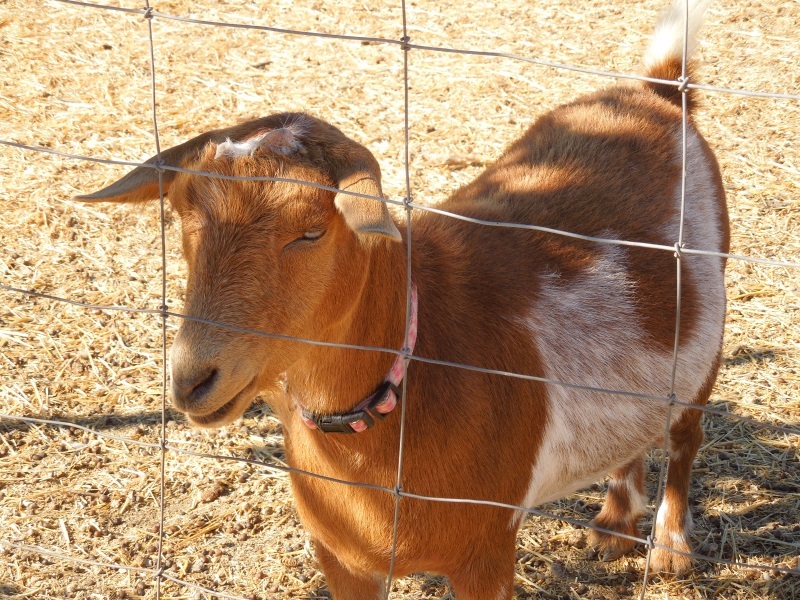 Goats are pretty common around the rural areas of Templeton and Paso Robles, especially around organic farms and nurseries. I used some in promotional photos in my blogs, such as this one about a foster child who was in between homes and coming to a new one in the town of In Between, Texas. The book is called In Between. 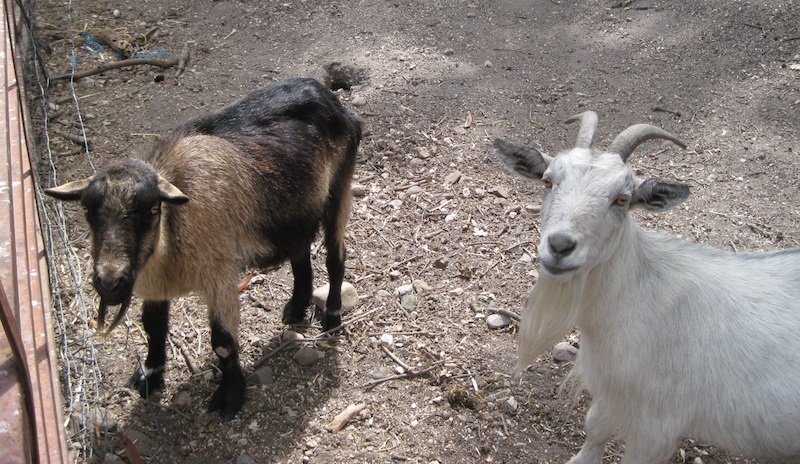 The goat in the introductory photo came from the now departed Fat Cat Farm in Templeton. If you click through, I think you will figure out why I used it. I used one of the goats in that last photo as my model in this birthday card I made on Zazzle. I think you will see the resemblance. The inside says "Happy Birthday, you old goat." 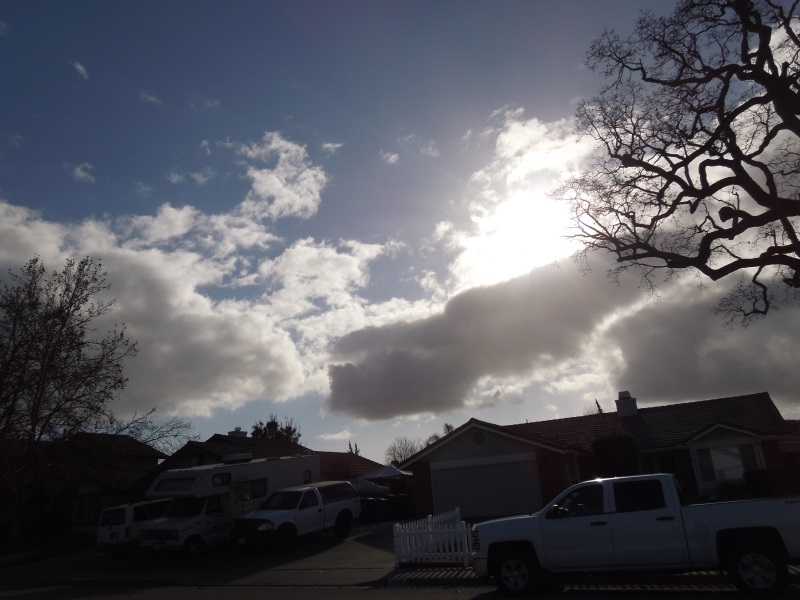 On Thursday afternoon I noticed the sky had some dramatic cloud formations. I thought with such clouds we would have a spectacular sunset. 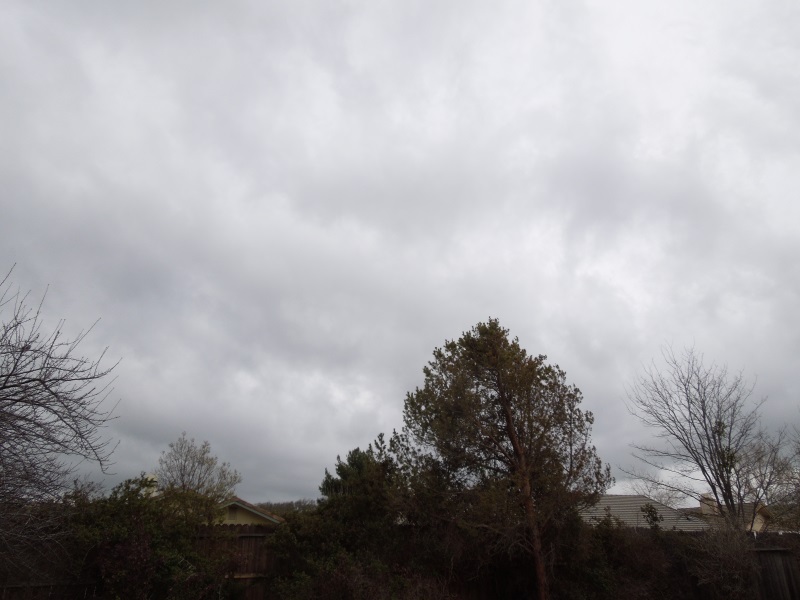 These cloud photos are from mid afternoon. 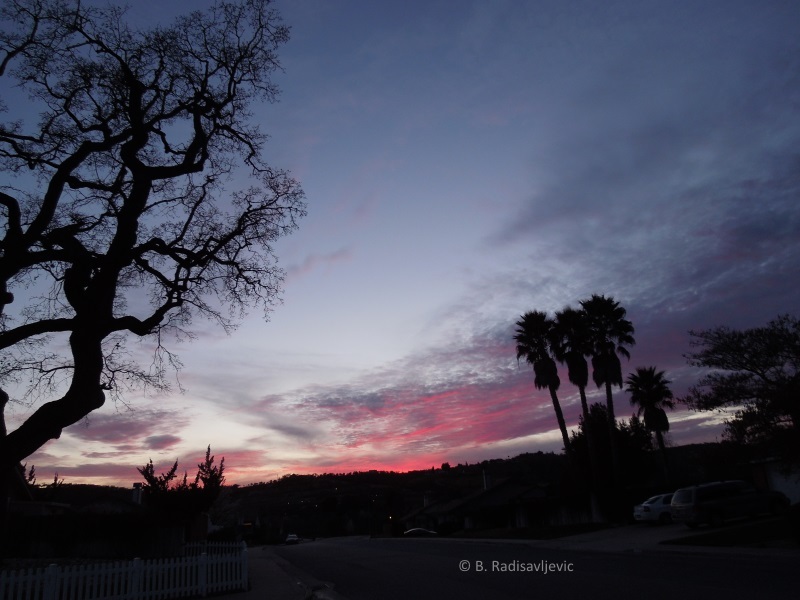 After taking these sky photos, I went back into the house to continue my work on the taxes, hoping to come back at sundown and get some great sunset photos. When I went back outside, all the clouds had disappeared and there was nothing left worth taking a picture of in the sky. I came back in the house and started to do some computer work and then my chair started shaking. It wasn't very hard shaking, but it was an earthquake. While I was looking it up online, my husband called from our Templeton house to ask if I had felt it. He said there was a lot of shaking there. By that time I'd found the site and discovered it was a 3.4 earthquake only three miles from Templeton. Here's the news report from the evening of February 18. When the 6.5 earthquake struck us in 2003, the Templeton house was also affected much more than the house in Paso Robles, where my mom was living at the time, only seven miles northeast of our Templeton home. 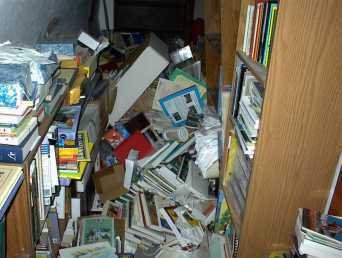 This is how our upstairs hall in Templeton, lined with bookcases on both sides, looked when the shaking had stopped. When we called my mom to see how she was, she had hardly noticed it, yet she was only a seven minute drive away. Such is the way of earthquakes. Personally, I prefer the ground to stay in one place. How about you? The weatherman promised rain for Wednesday, and I waited all day for it but it didn't come. In the late afternoon I went out to look at the sky and it did seem to promise rain. But no rain was falling yet. Then I began to hear a bird singing from a tree. It was a cheerful song, but it took a while to find the bird, which was hidden behind some high branches. Here it is, singing for us. Sorry it's hard to see. I seems it picked the best hiding place in the tree. It took a few more hours for the rain to start falling, but as I'm writing, it is beating a steady rhythm on my roof. I expect to sleep soundly tonight.